Introducing Evergreen Life Healthcare Messaging, solutions designed to transform doctor-patient communications and put your knowledge in the patients' hands. In-built Healthcare Messaging technology allows a practice, CCG, local authority or Public Health Department to communicate with patients using online patient-facing services. We help GPs empower their patients to view, track and share their medical records. Messages can also be targeted for specific audiences, so practices or Local Authorities can focus their messaging to drive better outcomes and meaningful patient engagement. Our Healthcare Messaging technology transforms doctor-patient communications and puts your knowledge in their hands. Better information to help your patients improve the management of their own healthcare. Evergreen Life is part of NHS Digital: quality assured by the NHS. Save time for patients by giving access to information online, without them having to visit the practice. Allow patients to easily correct inaccuracies in their record. Increase patient compliance and see better preventative health behaviour. Improve patient understanding, communication, reinforce trust and confidence. Help prepare patients for consultations. Compensate for poor or complex communication during consultations. Make best use of GP and hospital clinic consultations. Help patients feel like partners in their own healthcare. Easily remind patients of information e.g. test results, appointments and prescriptions. Need help promoting online patient services? Using Evergreen Life can help improve patient care and save your time and money. 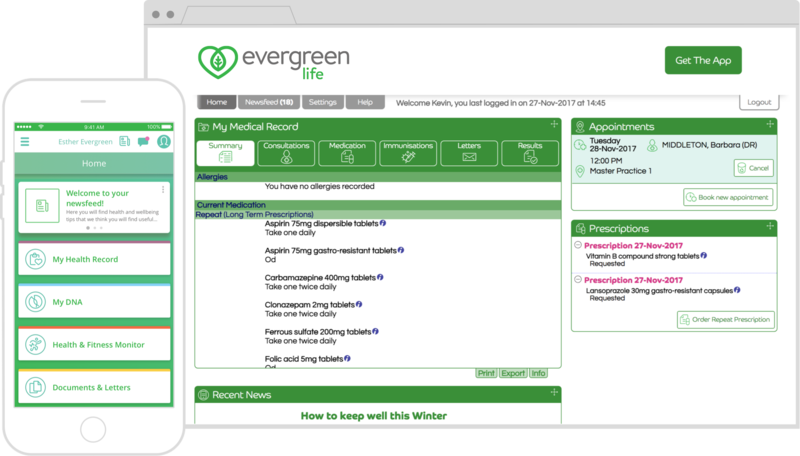 Evergreen Life is part of NHS Digital: assured by the NHS. Streamline and improve communication with your practices and patients. Target communication to specific groups, effectively, confidentially and anonymously. Ensure that the right patients get the right message at the right time. Easy to use anonymised reporting on which patients have read messages and acted on information. Need to reissue a Linkage Key? Having trouble reissuing a patient’s linkage key so they can use Evergreen Life’s online GP services? Don’t worry, use our handy guide.